Update: BMW April Fools Day 2012, the BMW Driverless Running Coach! BMW, April Fools Day 2011, BMW M3 Royal Edition! BMW April Fools Day 2011 Royal Edition M3! BMW have a long history of running April Fools Day ads and this has been continued for April Fools Day 2011. 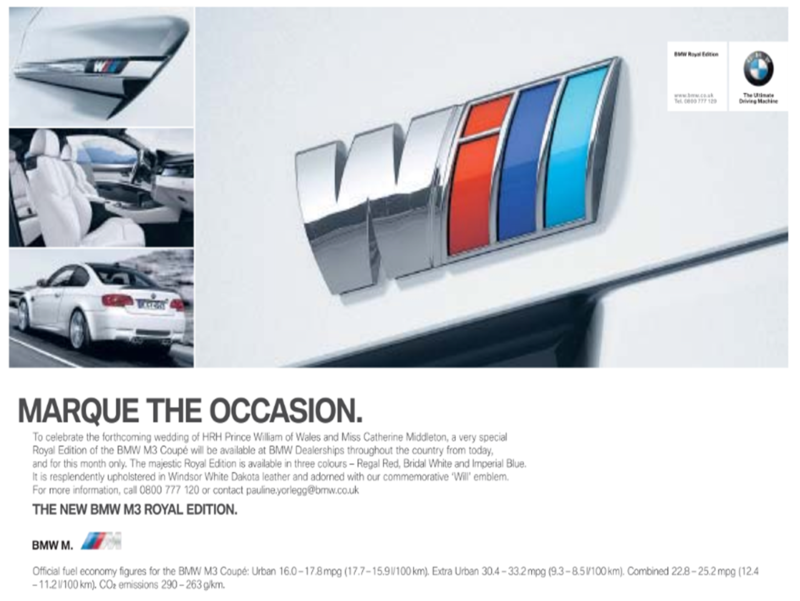 This year the BMW April Fools Day ad is based around the Royal Wedding as they announce the BMW M3 Royal Edition! 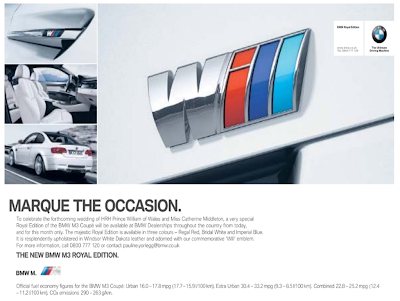 To celebrate the forthcoming wedding of HRH Prince William of Wales and Miss Catherine Middleton, a very special Royal Edition of the BMW M3 Coupe will be available at BMW dealerships throughout the country from today, and for this month only. The majestic Royal edition is available in three colours - Regal Red, Bridal White and Imperial Blue. It is resplendently upholstered in Windsor White Dakota leather and adorned with our commemorative 'Will' emblem. Another great, topical April Fools ad from BMW!